Preheat the oven to 350°F. Spread the pecans in a single layer on a rimmed baking sheet and roast them for 8 minutes. Meanwhile, heat the butter in a large skillet over medium heat. Add the shallot and sauté until it is soft and translucent. Add the stock to the skillet and, using a rubber spatula, scrape and mix in any bits that are stuck to the bottom of the pan. Add the riced cauliflower, thyme, bay leaf, salt, and pepper to the skillet. Cook for about 15 minutes, until all of the liquid has evaporated and the cauliflower is completely cooked and tender. Remove the thyme sprigs and bay leaf and discard. 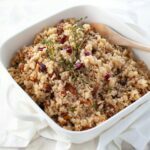 Mix in the roasted pecans, Parmesan cheese, and dried cranberries. Taste and add more salt and pepper, if desired.